She is one of the greatest entertainers of our time. Although she is the youngest of the famous Jackson family, don't call her "baby." Her name is Janet. Ms. Jackson, if you're nasty. Her professional career started at the age of ten with her acting debut as Penny on Good Times. She recalls that before production even began, she was told two things: she was fat and needed to slim down. Sure she was used to her brother Michael's teasing, but this was Hollywood. And so begins her habit of turning to food for comfort and struggling with fluctuating body weight. It took most of Janet's adult life to accept who she is. This is not an autobiography. Janet insists this book is a journey, that admittedly she is still taking. Through sharing personal stories of herself, family, fans and friends, readers are taken along this journey of finding and loving your true self. Her goal is to help people find answers and understand why we do, what we do. Fan mail, personal recollections, fitness secrets, customized recipes, and life-changing tips are revealed. Rumors are addressed, and never seen before pictures are shared. I had to take a moment of silence when I read the dedication page: "To Mike." So simple, yet so meaningful. As I read further, I empathized with her self-esteem issues. I overstood her addiction to food. She's not perfect. She's flawless. She's highly emotional. In fact, her feelings translate through the page and I even teared up a few times. 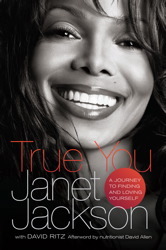 I thank Janet for putting it all out there in the format of a book. Trust me bookhearts, we can all relate. It's all right to be different. It's all right to show the true you. Enjoy the video clip below of Janet's interview with Piers Morgan - Part 1. Pick up the book today and/or post your thoughts. I had a flash back of Mike too! Gone too soon and too young. I'm liking this book so far and can relate. When she started talking about binding breast though..I was like WTH? There are a few WTH moments.